Singapore kept its position as the world's second-most competitive economy this year despite concerns over rising business costs, tighter labour policies and slowing growth. This is the fifth year running that Singapore has come in second behind Switzerland, which stayed in pole position in the annual Global Competitiveness Report, compiled by the World Economic Forum (WEF). The ranking of 140 economies is seen as the most comprehensive assessment of its kind. 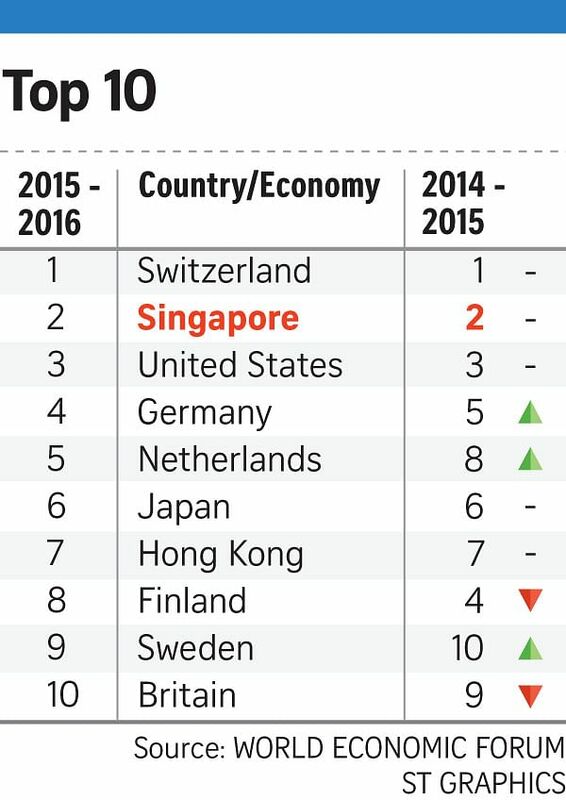 The WEF said Singapore was one of the most consistent performers across economies, faring well in the 12 factors assessed in the study such as infrastructure, health and education, and technological readiness. The Republic did especially well in terms of goods, labour and financial market efficiency, the WEF noted. In particular, Singapore can rely on the most flexible and the second-most attractive labour market in the world, though female workforce participation remains relatively low. "With the best higher education and training system in the world, Singapore is well placed to increase technological adoption, business sophistication and innovation," the WEF said. These factors also contributed to Switzerland coming up tops in the competitiveness rankings. It is a world leader in innovation, thanks to its world-class research institutions, high spending on research and development by companies, and strong cooperation between the academic world and the private sector, the WEF said. "Many other factors also contribute to Switzerland's innovation ecosystem, including the level of business sophistication and the country's capacity to nurture and attract talent." The United States retained its No. 3 spot in the rankings. Although many risks loom on the horizon for the US economy, its recovery can build on improvements in institutions, its macroeconomic environment and the soundness of its financial markets, the WEF said. Two other Asian economies besides Singapore - Japan and Hong Kong - also ranked in the top 10. Other major Asean economies - Malaysia (18th), Thailand (32nd), Indonesia (37th), the Philippines (47th) and Vietnam (56th) - ranked in the top half of the overall rankings. Economists noted that while Singapore has maintained its strong ranking, there is still room for improving innovation and business sophistication here. "Competitiveness is a relative game, it's not so much where you are today but where you are compared with others who are also moving forward," said OCBC economist Selena Ling. "We can't be complacent... Factors which worked well for us in the past will become taken-for- granted norms in future, so it depends on where we can push ahead. The area where we still need more work is innovation." DBS economist Irvin Seah agreed, noting that Singapore's position as one of the world's most competitive economies boils down to whether it can deliver value to justify the higher costs of operating here. However, others noted shortcomings in the WEF's rankings. Associate Professor Tan Khee Giap of the Lee Kuan Yew School of Public Policy said the rankings do not give a clear idea of the levels of competitiveness in different parts of the same country. "For instance, different cities or provinces in China might fare differently," said Prof Tan, who is also the co-director of the Asian Competitiveness Institute. "They have also been revising the indicators used, so it's difficult to compare the rankings across time," he added.